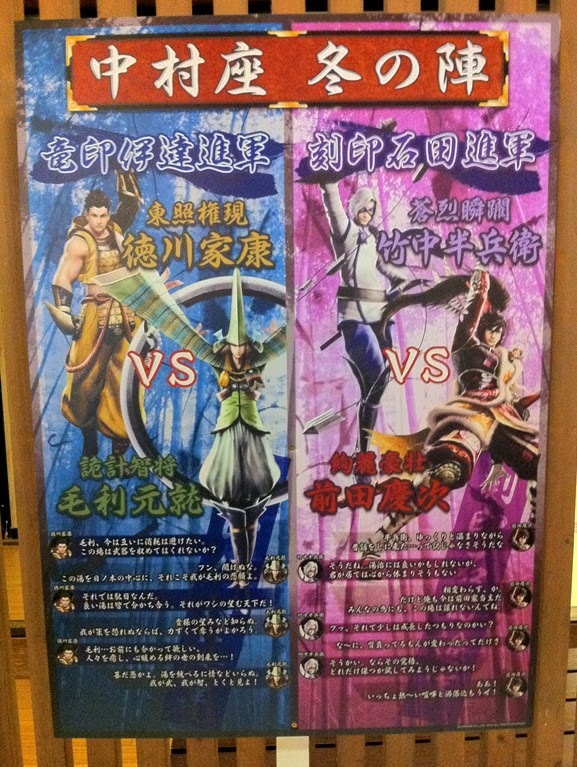 Sengoku Basara 4 x Oedo Onsen Monogatari ~The Advance On Oedo Onsen Monogatari!~ was the second collaboration between Capcom and the Oedo Onsen Monogatari spa in Odaiba, intended to promote Sengoku Basara 4 in a lighthearted way. The event ran between Saturday 18th January and Tuesday 11th February 2014. 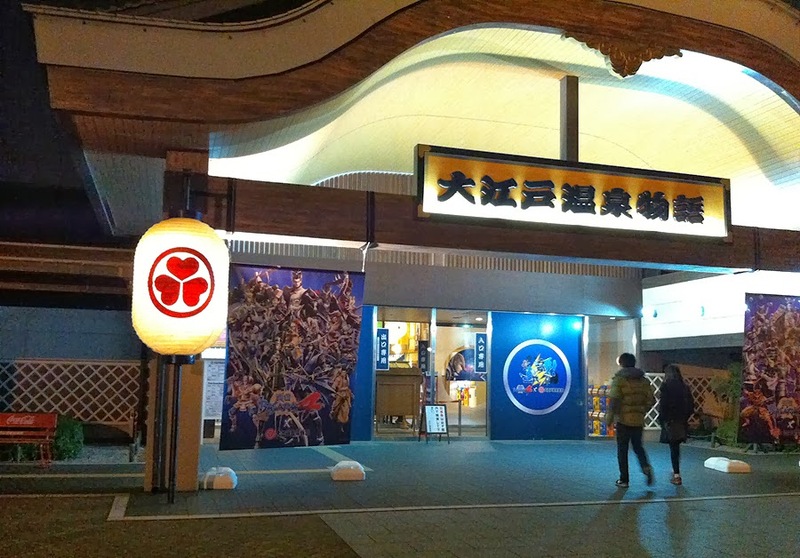 Due to other commitments, I visited Oedo Onsen Monogatari late in the evening during the latter part of my holiday. This had advantages and disadvantages: the crowds were mostly gone and the ticket price was discounted for customers who arrived later in the day (I had a discount coupon from Basara Matsuri, too, so I made a significant saving). However, I hadn't realised that the Sengoku Basara 4 stamp rally game was only open during the daytime. It closed just as we arrived. The other disadvantage was that it was very difficult to take good pictures in the poor lighting, so please forgive the quality of this photo report! Since Oedo Onsen Monogatari isn't all that well known in the west, I'll describe the entire visit. The venue is accessed via Telecom Center station on the scenic Yurikamome line, a stone's throw from central Tokyo. The only thing that you need to bring with you is a credit card or a large amount of cash; everything else is provided when you arrive. Passing through the entrance is like stepping into another world. The only other people at the park so late in the evening were various pairs of girls delighted by the Sengoku Basara 4 tie-in, and an enormous group of Chinese tourists who had apparently come to enjoy the spa facilities. Traditional Edo-style bathing is the theme and the park uses a stylised version of the Tokugawa clan's crest as its logo. You stow your outdoor shoes in lockers after passing through the door and then check in at the front desk, where you're issued with a special wristband. This band is very important - it's used as proof that you checked in, it unlocks your (huge) assigned locker in the changing rooms and it pays for any food or activities you want to enjoy during your visit. The code printed on it tells you where to find your locker once you're inside the changing rooms. 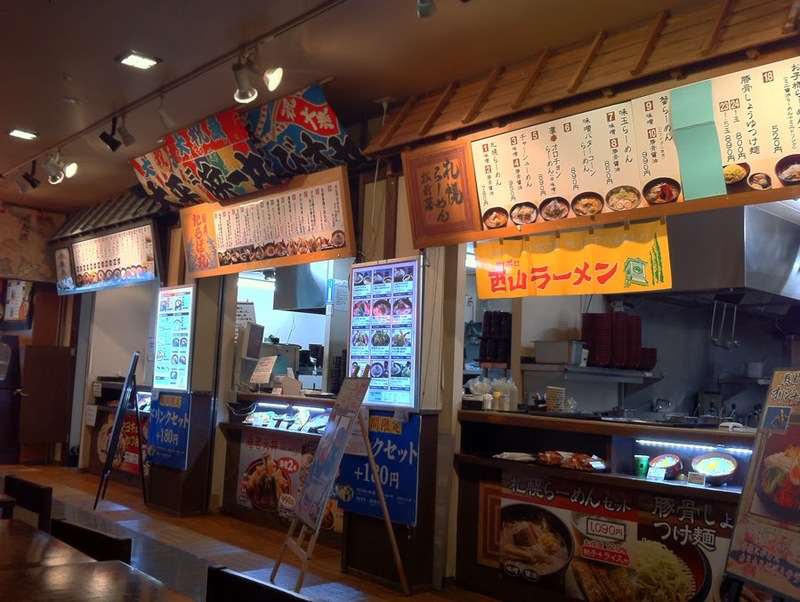 Unlike most of the places I talk about on this blog, the staff at Oedo Onsen Monogatari are used to dealing with foreign tourists and all of the important information is displayed in English, Korean and Chinese as well as Japanese. The first thing you have to do is choose the yukata and sash that you'll be wearing for the rest of the visit. They have plenty of extra large yukata available to accommodate hulking foreign visitors as well as detailed pictorial instructions inside the changing rooms to help you wear it correctly. After dressing up and stowing my belongings, I stuffed my camera into the sleeve of my yukata and, bypassing the relaxing gender-segregated baths entirely, stepped out into the communal area. 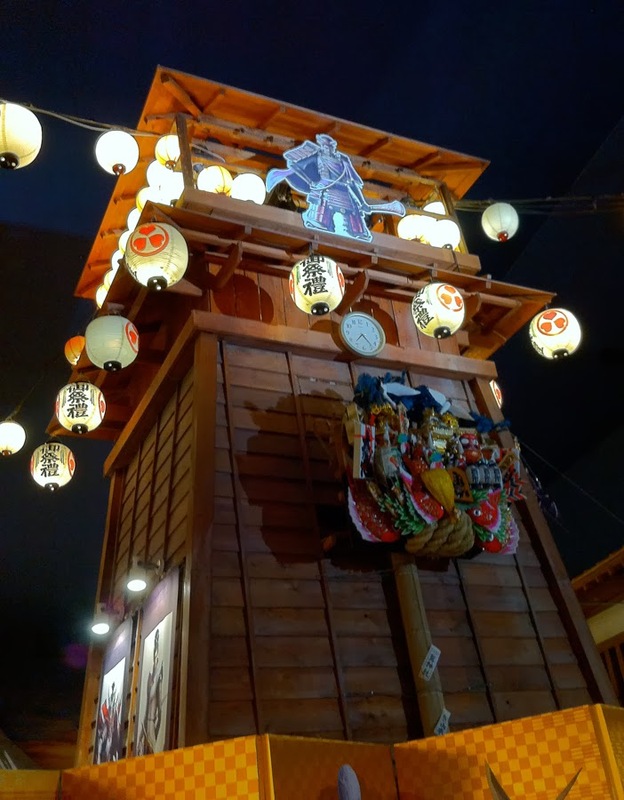 I liked the huge cardboard Tadakatsu suspended in mid-air, as well as this towering Yoshiteru. This must be how Keiji feels when he shouts up at him in the game's opening. 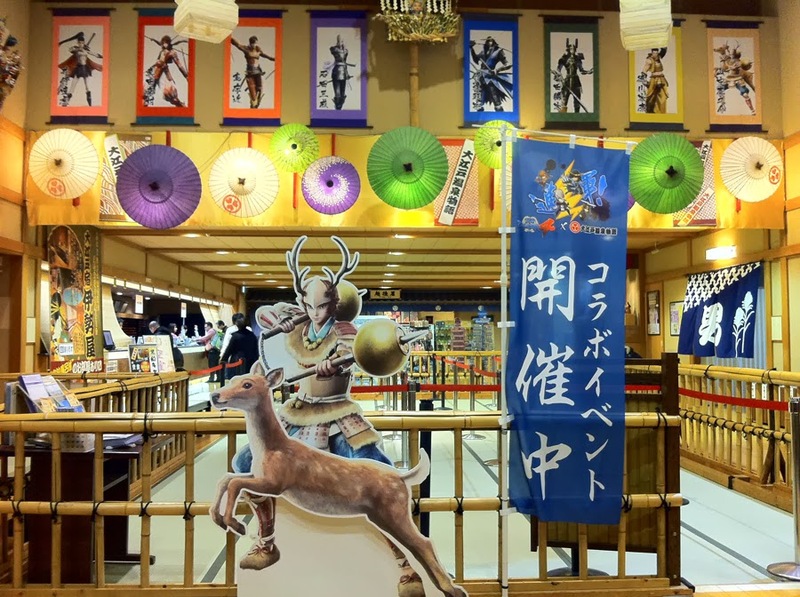 The Sengoku Basara 4 decorations were everywhere. The way that the staff had arranged them around the regular onsen signs was quite funny. I mentioned above that you use your wristband to pay. None of the shops in Oedo Onsen Monogatari accept real-world money, so you have to pay for everything by letting the staff scan your wristband and settle the bill at the end. It is very convenient, except that it makes it terribly easy to spend a vast amount of money if you're not careful. We visited the game stalls first of all. 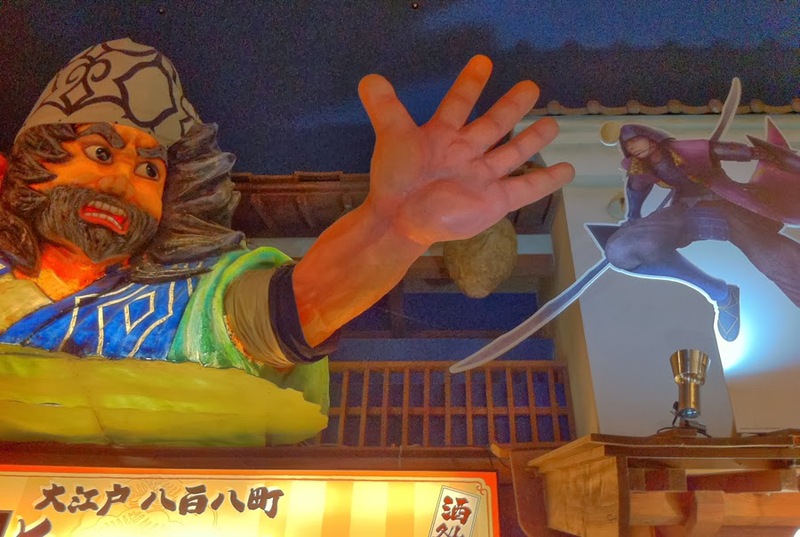 This one required you to throw balls or shuriken at the shogun; you could win different prizes depending on how many of his vital spots you could hit. I decided that metal shuriken would be too dangerous for someone like me and opted for balls instead. Bombarding Yoshiteru with projectiles felt a little weird. I also played a shooting game where you fired rubber bands at a bunch of enemy formations. 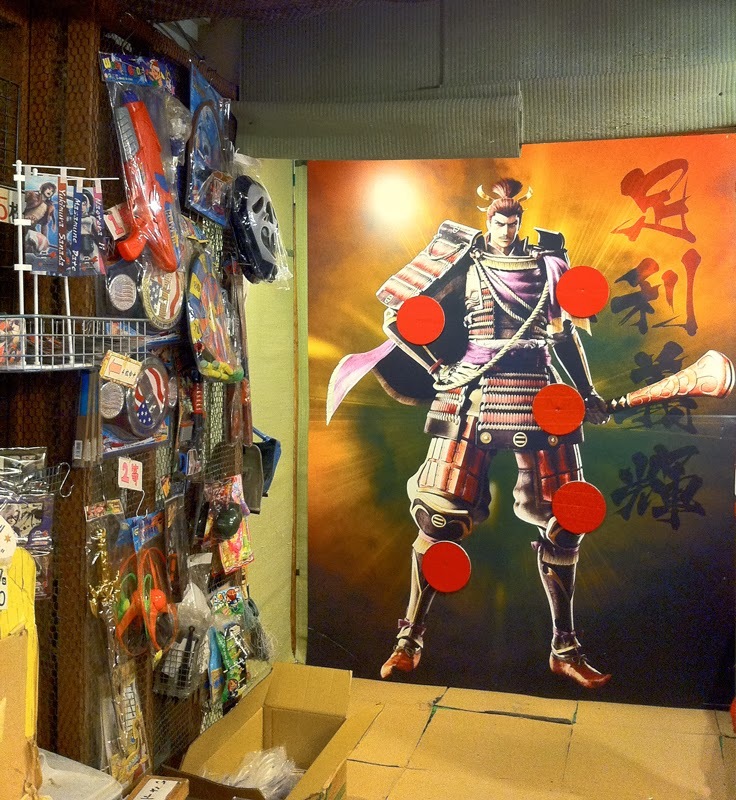 The merchandise stalls were nearby too, packed full of goodies based on Sengoku Basara 4, historical figures, regional mascots and cartoon characters. The merchandise was mostly bathing-themed. Although the stamp rally game had ended for the day, the stamp rally posters were still set up so we walked around looking for them, pretending to be able to participate. Each poster presented battles between various groups of characters so you could have fun reading the characters' dialogue even without being able to use the stamps. All of the exploring had left my travelling companion and I rather hungry, so we went to check out what was available. 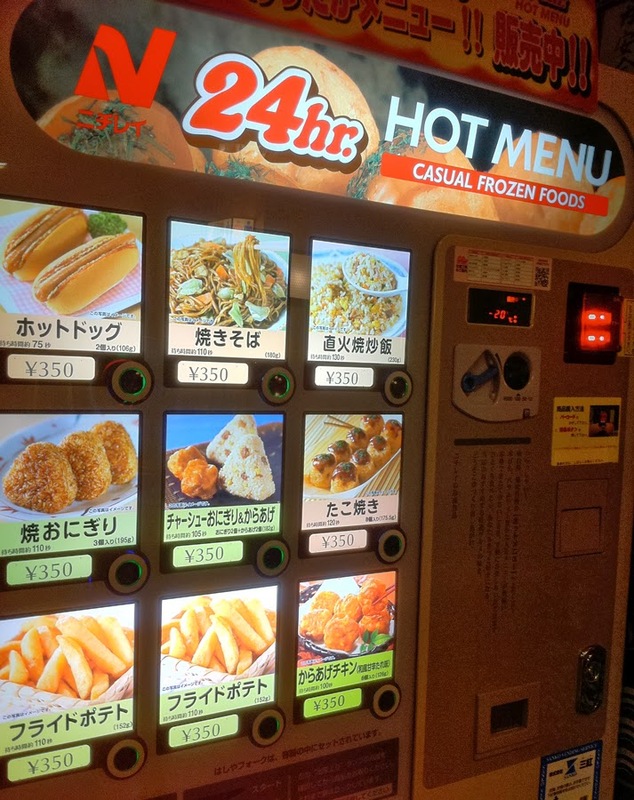 The variety is amazing: there are numerous food stalls throughout the park and if you're feeling unadventurous you can even grab a savoury snack from the vending machine. Since the purpose of my trip was the Sengoku Basara 4 tie-in event, the vending machine was forbidden! Most of the food stalls were offering special meals which came with exclusive onsen-themed stickers. To start off with, I chose Kojuurou's Personally Nurtured Crunchy Burdock Salad, a hearty bowl of cold ramen in a vinegary dressing topped with bean sprouts, tomato, sweetcorn, broccoli, lettuce and crispy burdock root. 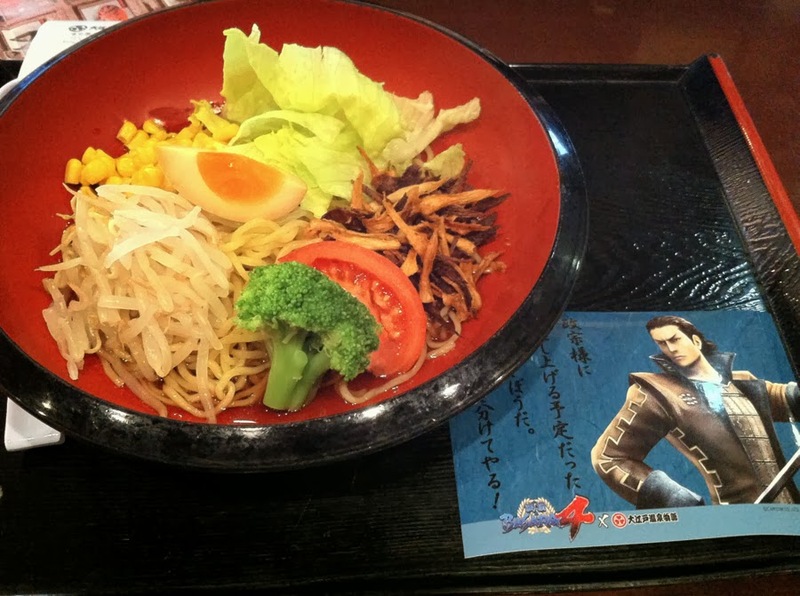 The menu board boasted that the piece of sliced egg on top was supposed to resemble Kojuurou's moon emblem. My partner tried Evens Or Odds? 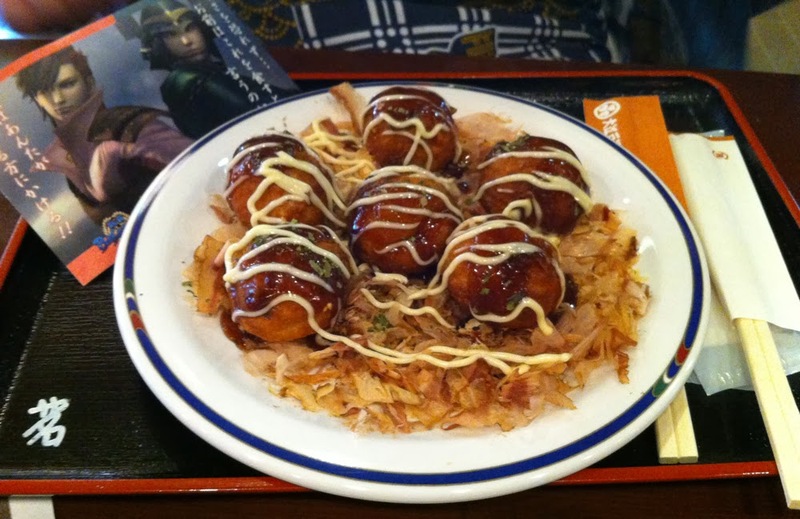 Shima Sakon's Russian Takoyaki, a plate of octopus balls with the gimmick that some had an extra-spicy kick. The difference was apparently subtle so it wasn't as painful as it sounded. To slake our thirst we picked a blueberry smoothie called Dance Of The King Of Misfortune. It looked really tasty on the menu - and indeed, it was. 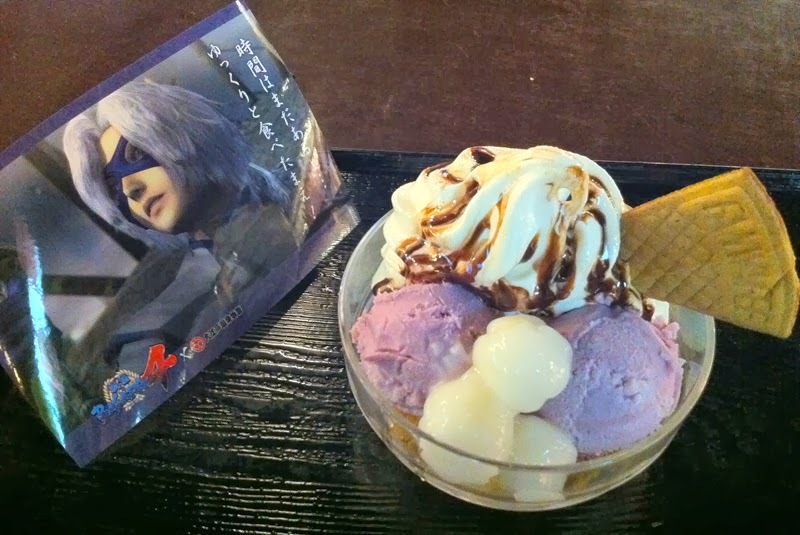 The link to Mitsunari seemed rather tenuous (they'd stuck a little chocolate triangle on the top but I wasn't convinced). 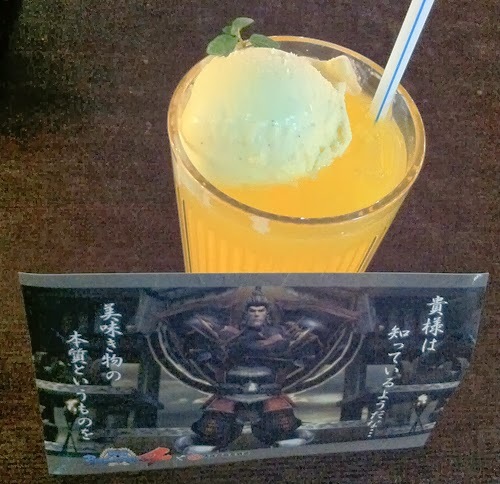 The second drink was a regular fruit juice float with a fantastic name. Thankfully the joke works just as well even when spelt out in English: Hideyoshi-sama's Screw Pi(neapp)ledriver. The bartender giggled when I made the insane-sounding request. 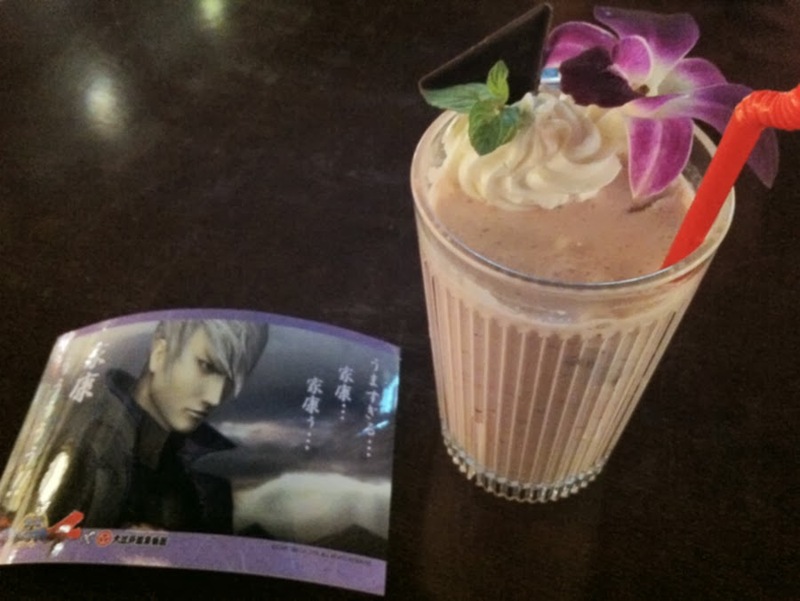 This drink had even less to do with the character than Mitsunari's had; they could have stuck a banana on top or something! Still, it made me feel a little manlier and I got to take home a Hideyoshi sticker as a reward. Last but not least came dessert. Since we didn't feel like shaved ice and I wanted the Hanbee sticker we picked the boringly-named Takenaka Soft Cream. The menu board explained that the chocolate sauce was supposed to evoke the image of his whip flying about at high speed. I was unable to work out what the rice dumplings were meant to represent. There were plenty of other delicious treats on offer. I'd have liked to have tried more of the dishes (like Motonari's okra sushi) but I was far too full, so instead we went to explore the outdoor foot bath. Even though it was January the foot bath was still open and the water felt intensely hot against my dried-out skin. There were also thousands of small pebbles embedded in the ground which made walking around excruciatingly painful - if I was told that the foot bath was actually some kind of torture area, I'd believe it. People who enjoy the spa experience were invited to sign up for extra activities like fish skin treatments and massages. It was eventually time to leave and take all of the goodies home. In the end I picked up the Masamune and Yukimura happi coats, the Sasuke poncho/cap garment, a few bath posters, some tinned sweets and a full set of bath salts with trading cards. 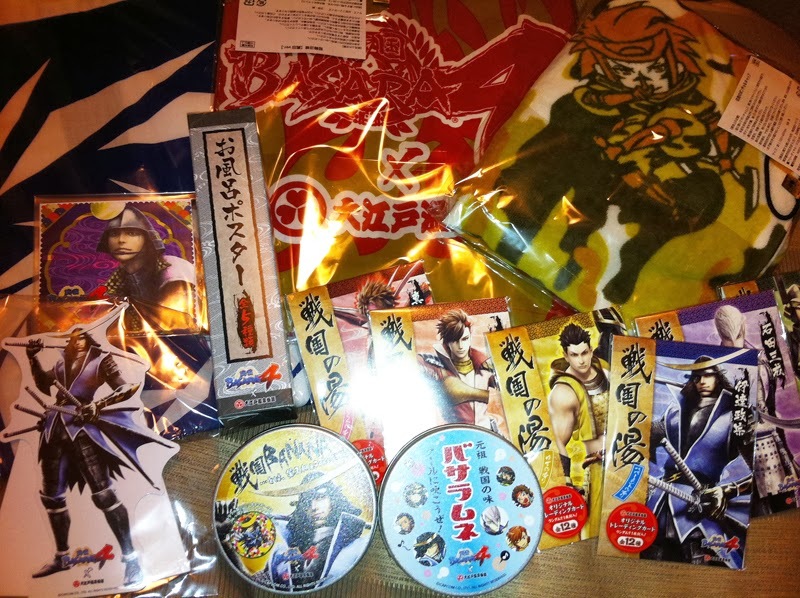 The small Masamune standee and Matabee cleaning cloth were prizes from the game stalls. 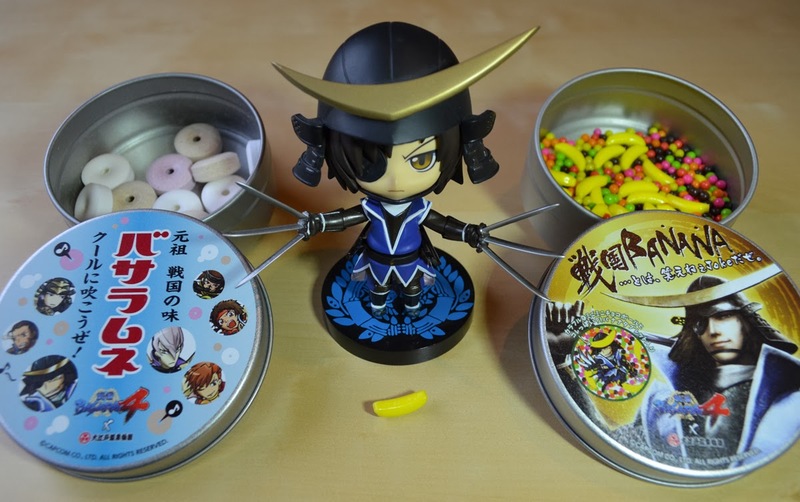 Here's a picture of the sweets next to a Nendoroid figure to show how small they are. The Basa-Ramune on the left are traditional chewy ramune-flavoured tablets, while Sengoku BANANA is a mixture of tiny bananas and even-tinier chocolate-filled candy balls. I thought that the event was fun and it made a good excuse to visit a theme park I'd never normally have tried. If I'd had more time (and money) I'd have liked to visit again before travelling back home to see the parts I missed out on. It's a shame we don't get so many special events in the UK! Professional photo reports from the launch can be seen at 4Gamer, Famitsu, Inside Games and Dengeki Online.